Steve Levine regularly represents official and unofficial creditors’ committees, senior and junior lenders, hedge funds, asset purchasers and other constituencies in restructuring matters and the documentation, structuring and recovery of complex financial transactions. With more than 30 years of experience in the bankruptcy and finance area, he has developed particular skill in debtor-in-possession financings, cash collateral and stay litigation, the analysis of avoidance and other causes of action and the negotiation, documentation and implementation of plans of reorganization. He is also frequently called upon by Brown Rudnick litigators to analyze potential disputes involving provisions of indentures, credit agreements and other types of complex financial instruments. 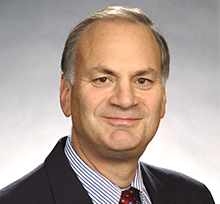 Steve has significant experience in asset based and specialty lending (particularly to retailers), high yield bond issuances, securitizations and representing consortiums of first and second lien and high-yield noteholders in out-of-court restructurings and debt-for-equity and debt-for-debt exchange offers. Steve has been selected by his peers for inclusion in The Best Lawyers in America© in the fields of Bankruptcy and Creditor Debtor Rights/Insolvency and Reorganization Law and Bankruptcy Litigation, and frequently speaks and writes on finance and reorganization topics. For more than 20 years, he has co-taught a course on Securitization and Structured Finance at Boston University Law School. Steve is a long-standing supporter of the Firm’s pro bono activities. In 2013 Steve was the recipient of the Fraser Award for Pro Bono Excellence presented by Volunteer Lawyers for the Arts.